Copyright 2013 - Image used by permission of subject. This year, one of my major goals is to be able to work more with cancer survivors. 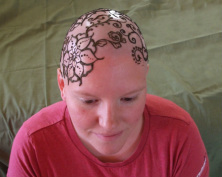 My experience with doing henna body art on a young breast cancer survivor was incredibly moving, and I would love to be able to work with more people like her. Had a wonderful experience tonight ... a lovely young woman named "Lala", a breast-cancer survivor who endured a double mastectomy as part of her treatment, scheduled an appointment with me to get some henna work up her side and on both "foobs". Her work took a little over an hour (including drying and taping up to protect the paste), and as she was leaving, she said "Thank you for making me pretty again." Surprised and feeling uncomfortable letting her words go uncontested, I said "Well, you're very welcome, but please don't say that _I_ made you pretty - "
"I know," Lala said, "But it's part of what you go through: you lose part of yourself, of your body; you grieve for what you've lost. So something like this is kind of like reclaiming a part of yourself." She thanked me again, we hugged, and she walked out into the chilly evening. I closed the door behind her, a lump in my throat. Thank you, Lala, for letting me be a part of your journey. Oi, my goodness, January's not even half through and the year is heating up already! I am so excited to see where henna takes me this year! Don't forget, my special is still running for private appointments scheduled for before February 14th, so call in soon! I am also available for birthday & graduation parties, bridal & baby showers, promotional and corporate events, and private appointments.